This bundle comes with both MyPilotPro Spider and MyPilotPro Spider Swivel mounts. Each mount is handcrafted one at a time and is precision cut on CNC machine in our shop. They are made from high strength phenol resin and are extremely light weight. Each suction cup snaps into place in their keyhole securely. We only use high quality suction cups that are produced in the USA which ensures you are not getting a mass produced low quality product. The hardware used on both mounts is the same stainless steel hardware used on our exterior aircraft mounts. We also take pride in sourcing those materials right here in the USA. In the end, we could have made these mounts less expensive but we wanted to make sure you are getting the best quality product possible made right here in the USA! Attaching both mounts is very easy. You simply locate where you want the mount to be place and push down on the top of all 3 suction cups. The mount will stay right there! Releasing the mount is just as easy. You simply pull on the tab of each suction cup and it releases. 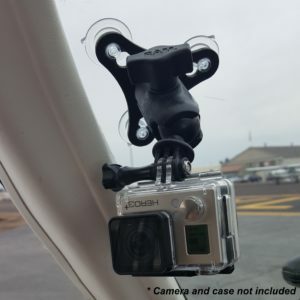 The suction cups on the MyPilotPro Spider are rated to hold 7 times the weight of a GoPro camera, it’s case, and the mount itself! Because the MyPilotPro Spider Swivel is a little heavier, its suctions cups are rated to hold 5 times the weight of the same equipment. You can be assured either mount is staying right where you put it! Easy to put together but needs at least one threaded retaining bar to mount the male attachment connected to the camera! I have recently flown with the Spider and it was a great addition to my mount collection! There was minimal to no shakiness of the camera and it went on great to the front shield window of my 152 Cessna. I also have the Swivel version, which I am NOW correctly using. There isn’t any wobble in it when you attach it properly! I look forward to flying more with your products! 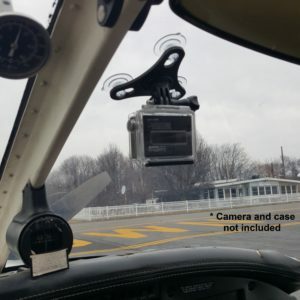 I have recently flown with the Spider and it was a great addition to my mount collection! There was minimal to no shakiness of the camera and it went on great to the front shield window of my 152 Cessna. I also have the Swivel version, which I am NOW correctly using. There isn’t any wobble in it when you attach it properly! Full review for the Spider- https://www.youtube.com/watch?v=6hB-Bq4kvGc. I look forward to flying more with your products!